As one of the most militarized islands, because of the dispute between Japan and Russia (the Kuril Islands dispute), Shikotan Island has remained a mystery to the world of tree rings and climate studies until now. Figure 1. 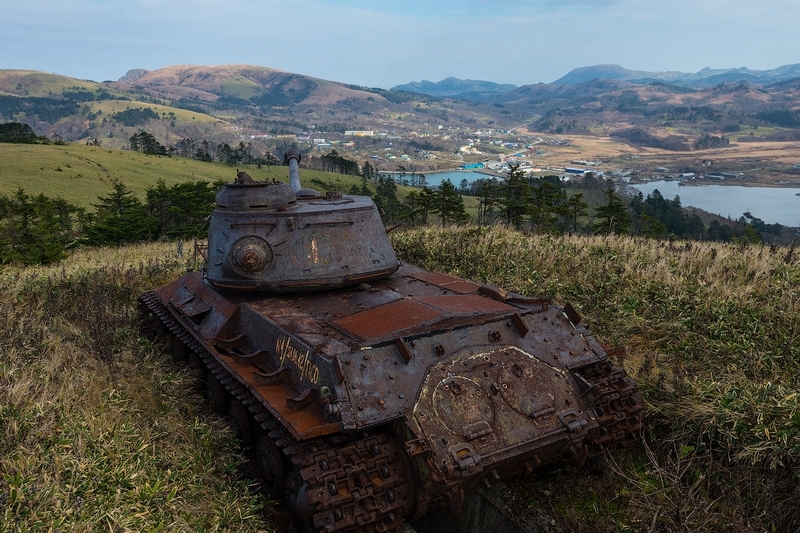 Deserted Russian tank on Shikotan island (from http://www.altercorecrew.com/wp-content/uploads/2015/01/1447443_original.jpg). Shikotan Island directly on the margin between the Pacific and Eurasian Plates. This special location indicates that this island is greatly influenced by geological factors, such as tsunami, earthquake, and large changes in climate (see photos below). Figure 2. 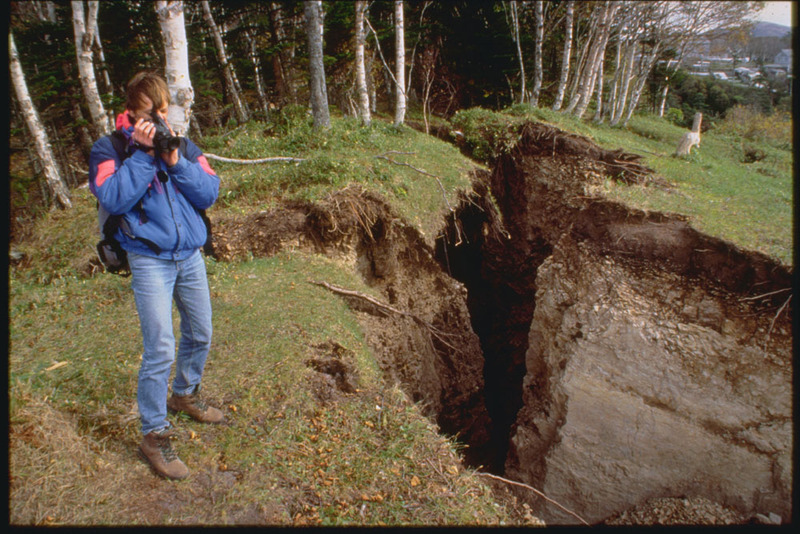 Big crack after the Shikotan Island earthquake of 1994. Figure 3. 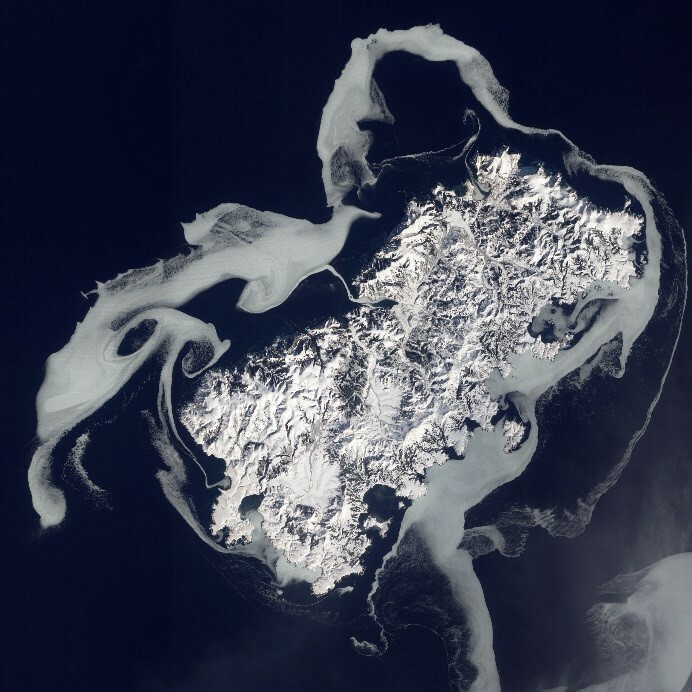 Shikotan Island surrounded by sea ice (Wikipedia). 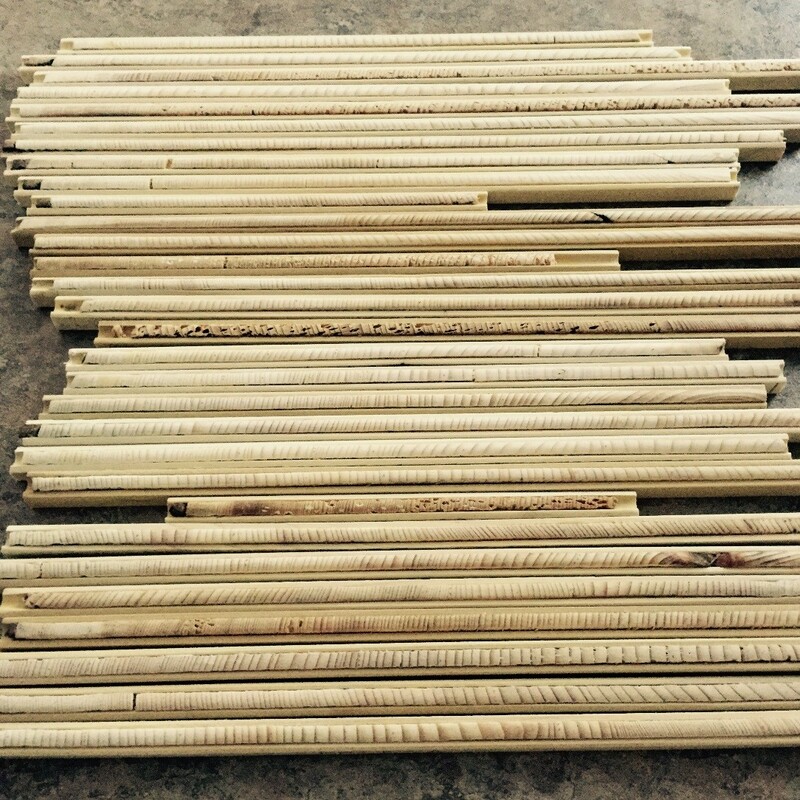 In order to better define the climate history of the Island in 2014 Russian geologist E. Dolgova and M. Alexandrin collected core samples from larch, spruce and fir trees on Shikotan islands. Figure 4. 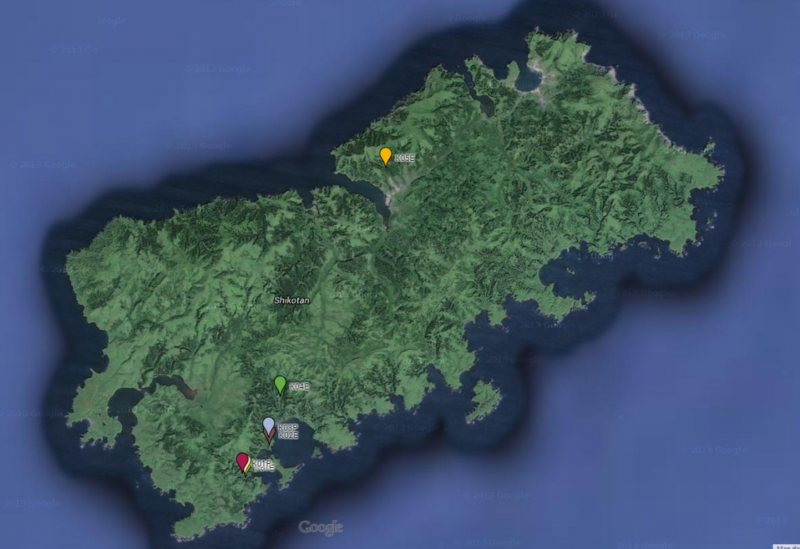 Location of collection sites of all Shikotan cores. The island is approximately 30 km long (image from GooglEarth). The purpose of this research is to find the climate information from these cores. These cores are properly sanded and marked. Forty six cores were collected from Shikotan Island and 20 were used to construct the chronology for this island. As we can see, some cores are less than 100 years old and some cores can be dated back to 18th century. Despite the age difference these 20 cores correlate with each other well.The purpose of this research is to extract climate information from these cores. These cores are properly sanded and marked by year. Forty six cores were collected from Shikotan Island and 20 were used to construct the chronology for this island. The tree ring width can be influenced by various factors other than climate signal, such as the growth trends and natural competition. The growth trends is the major factor that we want to eliminate. 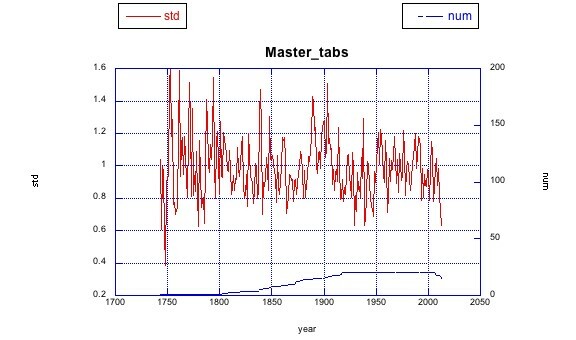 The above picture shows us the standardized tree ring measurements by removing the growth trends. The blue line is the sample size. This is the first tree-ring record from Shikotan Island. The standardized ring width chronology has a slight downward trend since 1900. I compared the standardized tree ring data with the meteorological data from Nemuro station (130 years long). It appears that September temperature has a strong negative correlation with the tree ring width. The correlation is 0.43, which is far above the 99% confidence level. The reason for such negative correlation is unknown, however, it may be related to changes in sea ice extent. In addition to examining the correlation between ring width and temperature, I focused on the possible relationship between tree ring width and natural hazards, such as tsunami and earthquake. After looking at the tsunami occurrence data from NOAA, I found that sometimes tsunami corresponded with a year of rapid growth. 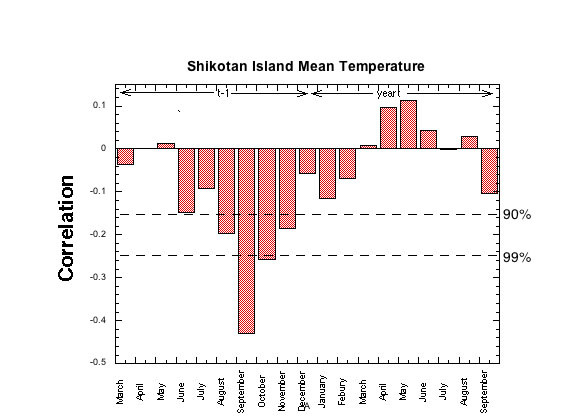 For example, in 1963, there are two tsunamis on Shikotan Island and some cores has a bigger growth this year compared to the year before. Photos below are two cores that show the correlation with the tsunami record and there are more cores have a correlation with the tsunami record. This relationship is under investigation.